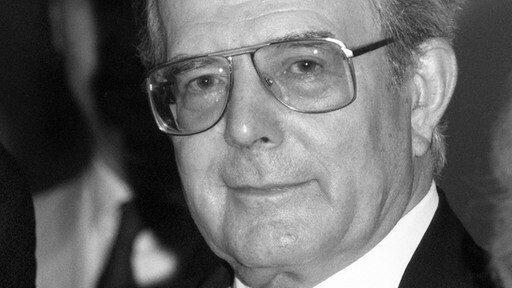 The conductor Wolfgang Sawallisch died yesterday, 23 February 2013, at the age of 89. He was born in Munich on 26 August 1923. Success came immediately, and he become the youngest conductor to perform at the Bayreuth Festspielhaus with Tristan und Isolde in 1957. For a decade he was the Principal Conductor of the Vienna Symphony until 1970. Then from 1971 to 1992 Sawallisch was Music Director of the Bavarian State Opera, after which he became Music Director of the Philadelphia Orchestra until 2003. Mr. Sawallisch is a musician from tip to toe. He is blessed with an abundance of what musicians call ”musicality” or ”musicianship.” This is far from a tautology; not all musicians have a lot of musicality, and its possession is always a matter of degrees. Musicality can transcend sheer musical technique and to some extent even interpretive skills. It somehow communicates directly to a listener (and watcher) no matter how foreign the idiom is to one’s own experience or how diverse its reach. Ravi Shankar is one example, Bobby McFerrin another. Musicality is the universal language that music is not. And in Mr. Sawallisch’s case, it comes through in every performance, whether at the piano or on the podium. Ill health led to his retirement in 2006. Sawallisch was well known as interpreter Richard Strauss’s works, and as an accompanist worked with Dietrich Fischer-Dieskau, Elisabeth Schwarzkopf and Margaret Price in this repertoire. He recorded Franz Schubert’s Winterreise and Robert Schumann’s Liederkreis with Thomas Hampson. His other recordings include widely praised interpretations of Strauss’s Capriccio, the four symphonies of Robert Schumann, Mozart’s The Magic Flute in 1973 with Peter Schreier, Walter Berry, Edda Moser, Anneliese Rothenberger, and Kurt Moll. He was given the Toscanini Gold Baton in recognition of his 35-year association with La Scala in Milan. His honorary degrees include doctorates from the Curtis Institute of Music in Philadelphia, Westminster Choir College of Rider University, and Villanova University. He is a recipient of the Pennsylvania Governor’s Distinguished Artist Award, as well as the Avatar Award for Artistic Excellence, created by the Arts and Business Council of the Greater Philadelphia Chamber of Commerce.